Amazon pulls reviews that they consider inappropriate and the criteria they use to determine that seems rather subjective at this time. As a precaution I thought I’d keep a collection of all my reviews here. I’ve included the link to the book with each as some of these were left on the .ca and .uk sites and won’t show up on the .com site. A dystopian science fiction story where the world is controlled by major corporations. A lot of thought and hard work has gone into making this book a winner. The main character Nash Korpes is well rounded out and a very interesting person who is basically used as a guinea pig for medical research. The plot is good with a lot of background machinations going on with many characters who have their own point of view. Sometimes the technical stuff was a bit drawn out, but overall this is a great read. There are terrorist attacks, doctors giving meds to manipulate and control Nash, self-treatment of drugs (ok, and brain zapping electricity), alcohol etc. Nothing and I mean nothing over the top. We don’t know at the end if stopping the treatments and the electrotherapy cures Nash or at least gets rid of his headaches. His ‘cousin-clone’ is walking around but with just a few modifications, so what will he be used for? And I know the military isn’t going to give him up so easily. Neither is the ‘love’ inducing military doctor. An Explosive “OMG!” Futuristic Sci-Fi Thriller! 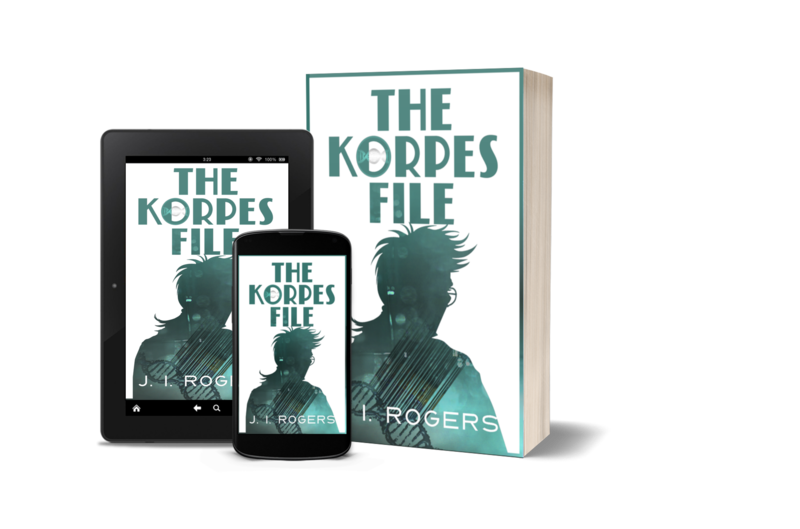 “The Korpes File (The 942 Series Book 1)” is a tense, rocket-paced, futuristic Sci-Fi thriller by Author J. I. Rogers that blends together the perfect balance of hero/antihero, lover/hater, friend/foe, and savior/coward. Although some of the settings may be familiar to Sci-Fi fans, the telling of this story blasts through one clever and unique path, carrying the reader forward through a mind-blowing interplanetary adventure where the ending can, in no way, be predicted. Rogers’ amazing characters are built from the ground up. Their personalities are based as much on their generational histories and ethnic origins as much as the individual traits to which they are ascribed. The diversity of characters and situations that drive this plotline forward, amidst a perfect storm of shocking and oftentimes devastating scenarios, causes cultural diversity to spur racial paranoia, impossible technologies to suddenly be made possible, and clashing personalities to find a way to mesh together despite their differences—allowing the main protagonists to somehow come together and work toward a common goal.“The Korpes File” is guaranteed to have readers scrambling for a free moment at every opportunity just so they can immerse themselves in this grand saga. And, as the story pounces from one shocking reveal to the next, it becomes perfectly clear that this novel is an “OMG!” thriller destined to be a Sci-Fi Fantasy fan favorite. To me, the characters are the driving force of in this book. They were all complex and well-drawn being both good and bad, all following their own agendas. It was the interplay between the characters which I mostly enjoyed, the dialogue being real and believable. The plot was intricate, and the science detailed. I would recommend this book to anyone looking for a different angle to their science fiction. Writer’s style kept me interested throughout, which very few writers have achieved with me. Looking forward to this author’s next opus. This story is a new take on futuristic science fiction. The 942 Series presents a corporate controlled world, where individuals like Nash are controlled and limited in their life choices. This book reminds me of older style storytelling, with a long narrative arc, following several characters, and their family members, over years. The epic scope of the story carries us along as we try to understand the past and future of Nash Korpes. He must struggle to survive political intrigue, corporate assassins, and mass killings. Nash is a very imperfect person. He is a scientific genius, who invents technology beyond what others can match. Yet, he has trouble controlling his emotions and actions. In the course of Nash’s oppression by his corporate overlords, he will lose everything, his loved one, his children, his family. Alone, with only a friend or two, he will struggle to gain control of his life, and throw off the chains encasing him. The decades that pass are filled with an unending conflict against the forces seeking to contain, and silence him. The author has brought an epic story to the page that contains an multitude of characters, who we care about, and want to succeed. I finished the story, and wanted to read more, so I could find what happened to each character I had been introduced to, even the villains. I would say this story is suitable for readers of high school and up. If you are ready to read an epic science fiction story, check this book out. As someone else mentioned, sometimes, to overcome impossible challenges, you must be both hero and villain. I enjoyed “The Korpes File” very much. The author has created a very complex story set in a futuristic world, filled with great characters. Fantastic dialogues and great interactions between the main characters. I should also mention the technical part, which is truly mind-blowing and will delight science-fiction fans. If I could, I would have given it 4.5 stars, and the only reason I’d take out half a point is that the female characters are not “techie” enough (there are a few, but they only appear in a few chapters). The main female characters are artists or doctors, why not some engineers, pilots, soldiers, etc. too? Aside from that, this a fantastic story, extremely well written. Thoroughly recommend. Welcome to the world of technician Nash Korpes, a claustrophobic dystopia where caustic rain burns the surface and fearsome creatures stalk the darkness. Within the tunnels and domes of the inhabited city states the human population survives on a diet of illicit liquor and Machiavellian manipulation of the masses. The ruling classes have the power and medications to subdue and subvert the populace, especially the Diasporan underdogs that our hero, Nash, belongs to. Trapped between the racial hatred of the locals and the two-faced treachery of his supposedly caring doctors, Nash’s genius with electrickery helps keep him alive. Tall, awkward, blunt and gifted, he must craft devices that both satisfy his masters and secretly buoy his hopes of escape and revolution. I hope she can drag herself away from her creations of clay to write the next instalment as I am eagerly waiting to read it. Even if dystopian sci-fi is not your bag, you need to read this book. Highly recommended. This book is basically Game of Thrones . . . but in a alternate, dystopian universe. The book stars around Nash Korpes, one of the many, many characters in TFK. Nash by far is one of my favorite characters. First of all, he’s an engineer so that’s already a huge ‘plus’ for me. Second of all, the odds are stacked incredibly against him, yet somehow Nash always manages to remain uncorrupted by such a polluted environment. Don’t get me wrong–Nash is by no means a perfect character–he has his flaws. But somehow, he still manages to retain a special type of inner strength. Some of my other favorite characters include Ashley, Davis, and Dylan. There are TONS of other characters, for which we all get chapters from their POV for. Like I said, TFK reminds me Game of Thrones in many ways, and the sheer amount of characters is one of them. Yet despite the huge cast, each character is unique and fleshed out. Each has his/her own backstory, motivations, fears, desires, etc. There is no ‘good’ guy or ‘bad’ guy. Everything is in shades of gray–just like real life. The intricacies of the plot is also truly fascinating, and I think a lot of this links back to the multitude of characters. While there is definitely a linear sense in terms of event progression, there is no “main” plot arc in the traditional sense. Rather, there are many turning points (think mini climaxes) that continue to build upon each other and culminating into the ending as Nash makes a huge decision in choosing which life path to take. As mentioned before, with so many characters, I think it’s amazing Rogers was able to give each character his/her personal agenda, and watching the wants/pursuit-of-their-wants of all these characters interact and clash once again reminds me of this particular quote: “People aren’t against you; they are for themselves.” There is no true villain in TFK. Sometimes it feels as if everyone is against Nash, when in truth, all these characters are simply looking out for themselves. Conflict arises when interests clash. In Nash’s case, he’s unfortunate enough that his unusual genetic makeup makes him an interest of many science and medical research. As a result, several organization has conducted some shady business that resulted in harm to dear old Nash. It would be easy to label these organizations/the people behind these experiments as “evil” or “inhumane”, and deem them the villains. And while it’s true that some of the actions of these characters are inhumane/unethical, Rogers also offers us a glimpse into their POV, and reveal the motivation behind their actions . . . to the point I felt sympathy for them even though poor Nash is suffering as a result. Kudos for creating ‘bad guys’ I cared for. Highly recommend this book if you enjoy books with complex characters and multiple POVs. Also, if you like GoT. A fascinating spin on dystopian science fiction. The 942 Series presents a bleak and dying world that brings out the very the best and worst of its inhabitants. In front of a background of political intrigue and deception stands Nash Korpes, a conflicted individual who rages against forces which seek to classify, contain, and silence him. The author has clearly done a lot of research into the hard science of their world, but the real strength of TKF is in its characters. They are rich, detailed, and completely free of cliche. Every motivation is clear and understandable, which makes the inevitable conflict a lot more engaging. TKF shows us that to survive the darkest of times, you have to be both hero and villain. A excellent book with well developed characters and a fascinating new world. These are Nash’s experiences as a brilliant young man sent to higher learning and medical experiments from a dispised minority population. Looking forward with anticipation to reading more from this author. This is one of the best books that I’ve read in a VERY long time, and I’ve read some pretty great books. J.I. Rogers is an author who puts a lot of thought and consideration into every minute detail of every character’s personality. In fact, I would say that one of the most fascinating aspects of this book is the extreme level of depth to each and every character. No situation is entirely black and white, but moreso smears of distorted gray, leading each reader to form their own opinions that could easily differ from person to person. Not only is there depth to every character, but there is an immense amount of depth and detail in every situation that presents itself. These two factors, when combined, lead to very rich story elements that leave a lot for the reader to think about. Now, for a bit about the characters. The characters in this book will make you feel their empathy, rage, and despair. I found them to be very well-crafted individuals, and I also found myself wincing in moments of pain, or feeling the gravity of tough situations in my gut. I can’t understate how wonderful the characters of this book are. Once I picked it up, I couldn’t will myself to put it down until I finished reading it. I absolutely cannot recommend this book enough; It is a read that you won’t regret, and won’t soon forget. I can guarantee that much. This book is a wonderful piece of art crafted with love and devotion. The author Has a knack to make you feel what the characters feel. All of the characters are so deep. You think you know a character but then you get an insight to their personality that you didn’t have before. If you read this book, You will be hooked. You will become a life long fan chanting, “WE WANT NASH!” You will not be disappointed with this book.